NAPNAP has been with its current law firm for the past six years. We're very happy with our current lawyers, but feel its best practice after all this time to send out an RFP for a law firm. Jill Carlin, our HR director, asked me to reach out to this community for recommendations. 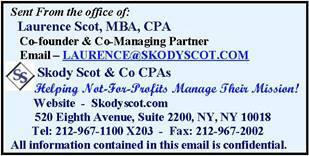 Do you have a law firm in the greater NYC area that you like? If so, please send me their contact information. 2. RE: Law Firm Recommendations? Nixon Peabody has a Rochester office that serves NYC clients and maybe able to offer competitive rates. Drinker Biddle & Reath is another firm. Can give you additional ones as well. 3. RE: Law Firm Recommendations? Both law firms are located in Manhattan.